ZTE's Nubia sub-brand to post new flagship on its new international website on January 5th? A teaser posted by ZTE's Nubia sub-brand on its Weibo site, indicates that the manufacturer will unveil a brand new flagship handset on its new international website. This will take place on January 5th, the day before the CES show kicks off in Las Vegas. 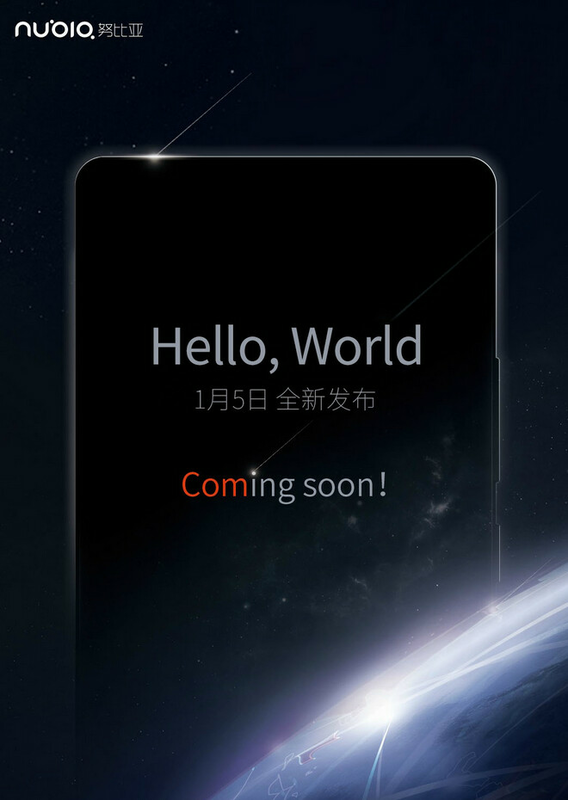 Many phone fanatics are hoping that the device unveiled is the rumored ZTE Nubia Z11. There is speculation that the Nubia Z11 will feature a metal build, and be equipped with a 5.2-inch display offering QHD resolution. That is 1440 x 2560 for those who don't like alphabet soup. The Snapdragon 820 is rumored to be under the hood, containing a quad-core CPU and the Adreno 530 GPU. 4GB of RAM is inside. A 20.7MP camera should adorn the back of the unit, with a 13MP camera in front for selfies and video chats. 32GB, 64GB and 128GB variations of the phone will be offered. ZTE recently shelled out $2 million for the nubia.com domain name, so we could see the new international site launched on January 5th at the same time that the new flagship is unwrapped. If ZTE does make the Nubia Z11 official, it would be the first Snapdragon 820 powered handset to be announced. The smartphone I'm waiting for. The Nubia Z9 is stunning. This one will surpass that. And if it gets an international version Google Playstore will be stock installed. No more custom roms needed then. The "Hello, World" makes think it might be a Windows 10 Mobile device, as that looks quite similar to Windows Hello. Could that be a not-so-subtle hint? i think a new smartphone will be unveiled on 5th, might be with SD652 on boat and flagship later in march or april with SD820.